Niz had just turned the grand old age of... say, somewhere in the early-30s vicinity. The older we get, the less receptive we are to surprises, so it was decided we would congregate somewhere fuss-free, with a tried-and-tested menu where everyone knew what they would get, at Alexis at the Gardens. Can't go wrong with Alexis' pizzas... particularly enjoy the Gambretto with rocket! This time however, I watched the others order. That evening, I was on...a liquid diet of some sort. First up... the Pizza Pollo. Meal owner was kind and spared me a slice, and even when cold, it was yummy and made me secretly hanker for more! 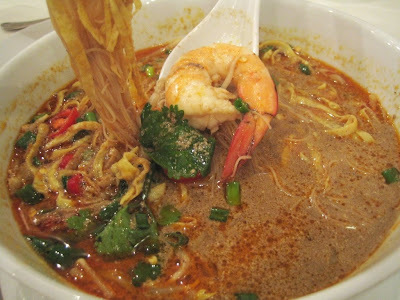 Others had the equally dependable Sarawak Laksa, swimming in rich, coconutty gravy. What a mega portion! 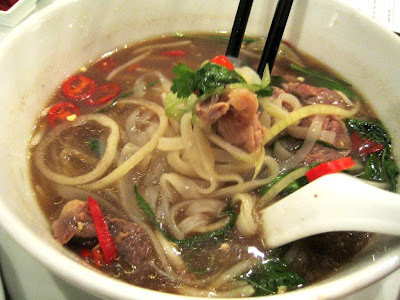 Beef Noodles arrived lukewarm. Fiz tsk-tsk'ed and sent it back to be heated thoroughly. We like our soup scalding hot, thank you very much! 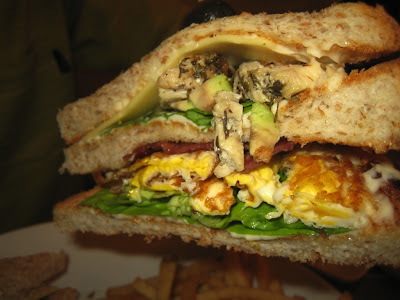 Club sandwich - Cheese, chicken, avocado, beef bacon, egg and the usual garnishing. But why oh why the shoestring fries? Shoestrings spell to me skint, ungenerous, emaciated, McDs! I like mine fat and substantial! Nuff said! :-) Hope it was a happy one Niz! I've only tried their tiramisu in Alexis, went there just for the dessert, and it was fantastic, one of the best I've tasted. Will definitely revisit for more desserts and main course. Simple meal for a birthday? 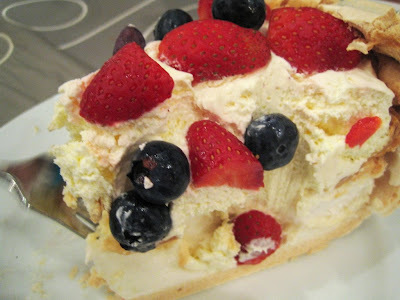 I am really not into cakes except for carrot cake and brownies, but the Pavlova is worth a try. been there once for main course n desserts. find their main course so-so but i heart the tiramisu. bah, the birthday boy is probably only a year younger than me, but i look 5 years older. curse my genes! I just ate at the BSC one last Sat - an alternative to delicious since we were so late for lunch. Poached chicken rice and pecan cheesecake were good tummy fillers. I usually go for the 4 cheese pizza. Guess it's time I tried this! ;) Lukewarm soup?? How can?? I want it hot hot hot! ohhh..the tiramisu alws been gd ;) and yes the 4cheese pizz too! at least this is one plc we knw keeps their std in food/cakes yes? 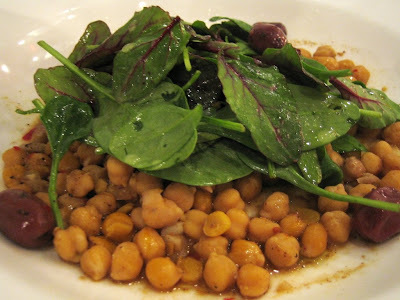 Sugar Bean, I think quite safe to stick to the desserts... and maybe pizza! Babe KL, definitely a must-order at any Alexis! Worldwindows, yeah we're a subdued lot of eaters! Had too much to drink! Ai Wei, what main course did you have? I didn't like the duck or the cod very much myself. Sean, yes he is blessed with a juvenile demeanour... to go with his behaviour! You would command respect with the appearance of age! Little Inbox, absolutely not!! I simply refuse to accept the word OLD! 30s is the ultimate decade to live, no!? Boo, poached chicken rice! I don't think I've been in company who ordered that.. so it held its own did it? Bangsar Babe, exactly! I just don't get cold soup, not even the types that's supposed to be cold, like gazpacho! The Nomad Gourmand, dependable to a T! But perhaps time for them to mix their menu up a bit? It's been like this for the longest time! The tiramisu looks so tempting! I can't resist it! It's been awhile since I ate here. I used to eat the sarawak laksa here all the time (in the 90s lah). Now, I go to alexis just for the cakes. 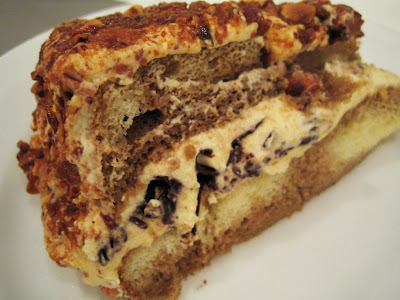 Still damn good (but fbb's versions of the pav and tiramisu are better, if I may say so!). they got their tiramisu from Su Chan, do they not? still rmbr that bad exp at that same outlet. when they stopped me from snapping a pic with my hp. J2Kfm, they didn't let you photograph?? Wait, were you using some huge SLR? Those can be very intimidating for paranoid restaurant management. 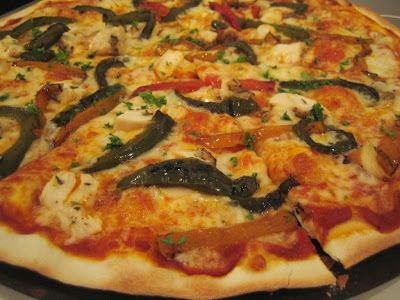 Food Paradise, thin crust all the way! I don't know of anyone who actually likes the thick doughy crust anymore... Pizza Hut's still making them? BSG, that's the best birthday wish he's gotten to date I bet! 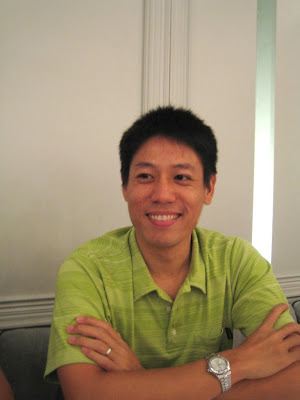 Wah u said like that I can be classified as Sinor citizen dee. Sign. Btw, this is very sensitive statement leh. Not much place got sell Sarawak Laksa, especially in Penang I never see one before, after came back from Kuching. Bring me to there to makan next time I go see you ok? Ciki, he looks like a momma's boy but when his mouth goes off in closed circles, there's no putting a lid on it!